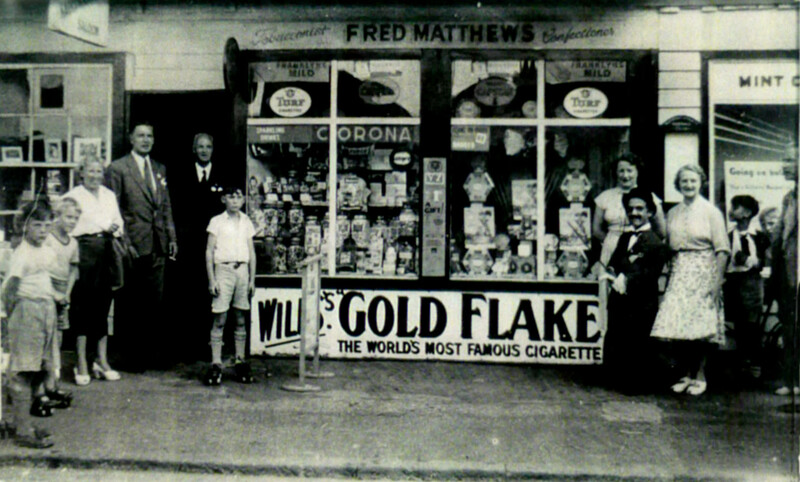 Here is a picture taken outside Fred Matthews shop in East St, believed to have been taken in the 1950's. I'm not sure, but it looks a bit like me on the left side of the picture. 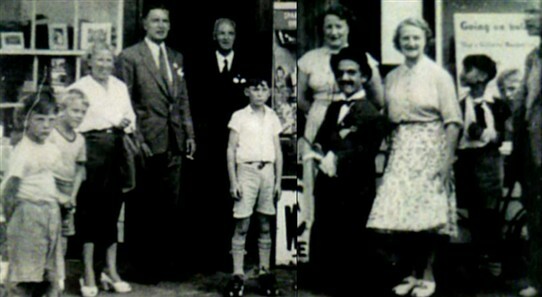 Fred is standing on the extreme right, also there is Olive Robinson who worked in the shop and Beryl Matthews. The smaller man with the hat, is the one who toured round the town in an open topped limo, giving out sweets to the youngsters. He then went on to stop at Freds where us kids could speak to him. I seem to think that he was a Sharps toffee rep, but not 100% on that. He came at least once a year and Fred used to advertise the date. This page was added by Len Bickford on 14/12/2017. 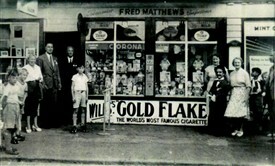 I have some happy memories of Fred Mathews shop. My brother and I were taken there to buy sweets and to have our haircut. I remember being lifted up and sat on a flat board to have my locks reduced. My brother reminded me that if you wanted to change your hairstyle you had to take a note from mum. I do remember that there was a metal sign standing on a pedestal outside the shop, I thought at first it was the little bloke standing between the two ladies from the sweetshop. On the left at the front is Terry McKinnel behind the fair-haired boy (I remember his face) is Mrs Mitchel.